Among the most sought after custom cars at the SEMA Show each year are those built by the Ring Brothers and for the 2013 edition of the massive Las Vegas automotive convention, the famous brothers will roll out their newest masterpiece – a 1965 Ford Mustang powered by a 358 cubic inch V8 sourced from the current NASCAR Sprint Cup lineup. Details are limited but the information included with the teaser image above states that this car will pack a whopping 710 horsepower. This year’s Ring Bros. project is nicknamed Blizzard and like their other recent SEMA project cars, this 1965 Mustang is an ultimate restomod machine. When the Ring Brothers build a custom car for the SEMA Show, they take a fairly minimalist approach to the exterior design so we arent likely to see a ridiculous body kit, a huge spoiler or the front end of a late model Mustang but we can expect a car that looks very much like the original 1965 Mustang except the standard steel body panels will likely be constructed of some lightweight material like aluminum and/or carbon fiber. The Ring Brothers may also add some unique aerodynamic features along the lower front end to give the car a more race ready, aggressive look. As the image above shows, the Blizzard Mustang will feature a set of huge custom wheels finished in black and brushed silver, wrapped in super low profile tires and set deep into the modified wheel wells. 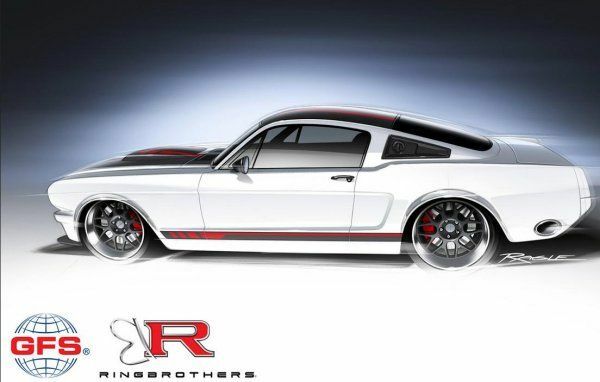 It is hard to tell from this sole piece of artwork showing the Ring Brothers 2013 SEMA Mustang but this year’s car could follow in the footsteps of past years and feature a subtle wide body package that literally widens the body whereas other wide body packages really just add flared fenders and quarter panels. In addition to the white paint scheme paired with black and red trim, the Ring Brothers 1965 Ford Mustang Blizzard project car appears to have an exhaust system that exits through the rear portion of the quarter panel behind the wheel arches. We can only see one side of the car in this artwork but I would guess that the exhaust tips will poke through the body on both sides of the car and depending on the mufflers chosen between the NASCAR engine and those huge side mounted exhaust ports – this Mustang should really roar as it rolls down the street. The Ring Brothers 1965 Ford Mustang Blizzard project car will make its debut in early November at the 2013 SEMA Show opens in the Las Vegas Convention Center and as more information on this great looking restomod Mustang becomes available, you will find it here on TorqueNews.com!